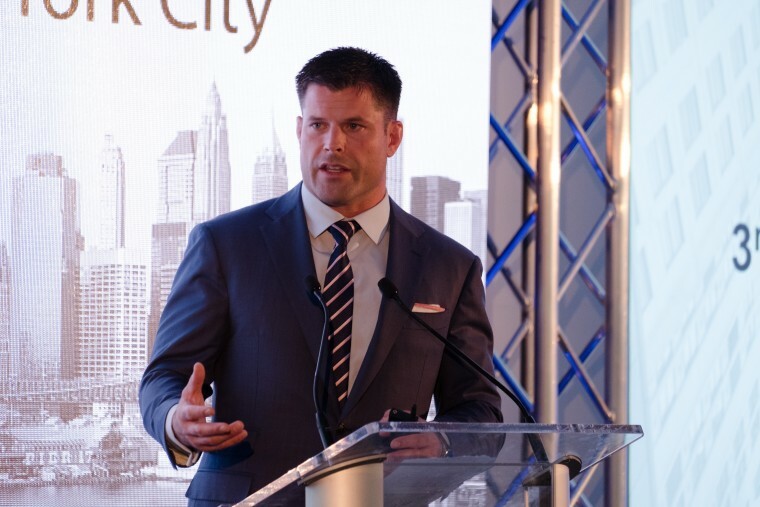 Brian Stann left the military in 2008, but the decorated Marine and MMA champ continues the fight at home, working through the nonprofit organization Hire Heroes USA to find meaningful employment for all veterans. The organization has enjoyed explosive growth since Stann took over as CEO in 2009, growing from a single office to seven nationwide, and helping 17,000+ veterans find jobs. Nevertheless, demand for Hire Heroes’ services is constantly growing. 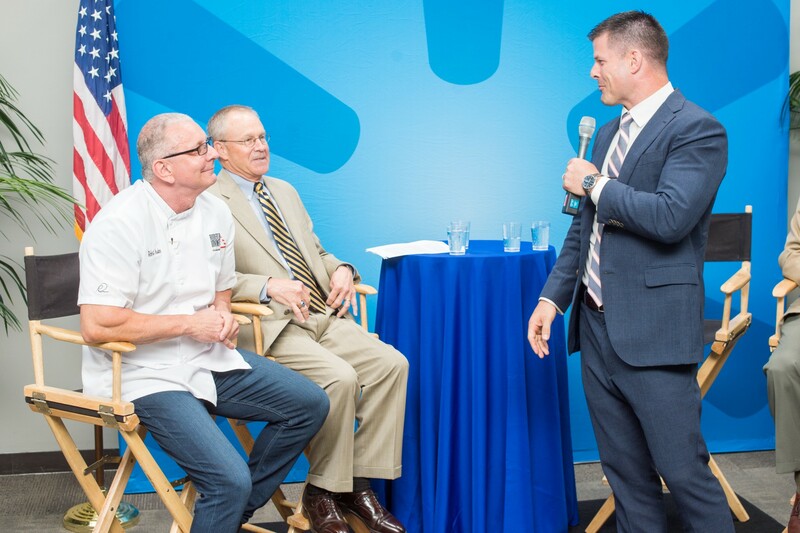 Stann spoke to Robert Irvine Magazine about the challenges Hire Heroes USA currently faces, and what makes America’s military veterans such a perfect resource for employers. RI: Hire Heroes USA was a single office when you joined in 2009. Now it has seven offices around the country. What were the biggest challenges to generating the revenue to do that and building it into the force that it is today? BS: In the nonprofit industry, the problem that you’re trying to solve has to be real. It can’t be fabricated. It has to be something that doesn’t just impact you or just one demographic, but has substantial impact on the community or the nation. This veterans issue, veteran employment, is that problem. There’s a definite economic impact to ensuring that our military service members return home and can find meaningful employment. That also has a big impact on enlistment because of the fact that we have an all-volunteer force. Imagine if military veterans came home and they couldn’t find work and they became a demographic where people looked at them differently, looked at them very poorly, similar to what happened in Vietnam. It would be very hard. We’d probably have to go back to having a draft. So we recognized that the problem was substantial enough that it merited significant focus, and there was really no one out there that was addressing it correctly to help solve it. From there, we were fortunate that our founder, John Bardis, who was a very successful entrepreneur and business leader, was the initial sponsor of the whole thing. He donated office space and office equipment so that we could get started. My first year in the organization was really me determining that the demographic that we’re trying to help needs a more personalized approach. There’s no website that you’re going to build that’s going to help solve the problem and help them transition effectively and find meaningful work. There’s no technology that’s going to give them all the knowledge necessary. It’s going to take some one-on-one career counseling. If you’re going to ask other people for their money so that you can do this, you’ve got to be able to prove that it works. I needed people that could be great career coaches, but I also needed minds that were analytical in strategy. I’m a big thinker. I’m a forward thinker. I needed someone that could help me operationalize this big idea and measure it at every step so that we could constantly improve it. Interestingly enough, I had spent several years in the Marine Corps with a guy Nathan Smith, who I grew very close to, like a brother. He was just starting his transition out of the Marine Corps right around the second year that Hire Heroes was in operation, 2010. We served together in the same company in Iraq during our second tour. We worked really well together because we had such complementary skill sets. We both have a very strong base in leadership. He has the ability to focus on something and put it to a level of detail, dig into data and really analyze it. I’m a very gregarious person who likes to go out, spread a message and develop relationships and maintain those relationships and motivate groups of people. When he came on board and we were able to combine our skill sets. It took about a year and a half from there for us to really start to catch, I’d say, our first ride, where we were consistently helping tens of military veterans and transitioning service members every single week. I wouldn’t say we were in the hundreds just yet, because you’re talking about a team of 12 people, but we started to get interest from the bigger funders because even for that small of population, we were able to prove what we were doing is working and having a meaningful impact. Every time we edited a resume, every time we did a career counseling session, every time we did a mock interview, we had it recorded. We could show them how much work we were doing per every donated dollar into the organization. Stann speaks at DC ceremony where the Walmart Foundation issued a $1 million grant to Hire Heroes USA. Robert took part in the festivities, hosting a cooking challenge. RI: I’m really struck by just how it has exploded on the backs of private donations. Do you get any government funding or are you totally private? We didn’t have any money for marketing, anyway. I was fighting [in MMA] at the time. That was getting us a lot of free attention. We were leveraging that to help build our mission. It was helping. As I became a top 10 ranked fighter, I would get a lot more media that I could use. People were generally interested, saying “Wait a minute? Who’s this fighter who also served in the Marines and isn’t just a fighter, but is running a nonprofit?” That helped tremendously. Really where we started to get our first funding was the Call of Duty Endowment. RI: That’s cool to see. That video game franchise is so popular and it uses the military as its subject so it’s great to see that they give back in a significant way. BS: Absolutely. In fact, the only thing that endowment funds are organizations that help veterans get jobs, because they’ve identified that as the biggest issue facing veterans. They’ve been phenomenal. It went from an initial, say, $60,000, to now, where it’s over a million dollars a year that they’re funding us. That’s always been where we raised the significant portion of our budget, in competitive grants that have been earmarked for nonprofits that can prove long-term impacts and that can showcase excellent use of donated dollars, because we do that. When you look at our Charity Navigator rating, we’re through the roof. We’re about as high as you can get. Everything we do, every dollar we spend is deliberate. RI: You mentioned that recruiting could fall if the employment issue isn’t addressed. That seems like something that the government would be really concerned about. The fact that Hire Heroes and other organizations like it need to exist privately, outside of the government—is it your view that the VA is doing enough? Do you feel like it fails veterans? BS: I think they’ve gotten better. I think organizations like ours have pushed them to get better. They still spend an exorbitant amount of money. We could probably—not probably—we could do a better job with the entire population of service members they’re trying to serve, with about a quarter of the money. It’s just fact. The good thing is that we’ve been complementary to a lot of the contractors who are hired through the VA and through the Department of Defense. We’ve been a massive resource for them. It doesn’t make sense for us to be enemies. We’re just trying to make sure that this generation of service members comes back to their community and leads again, and wins, that the American dream is a real thing for them and not something that they no longer get because they chose to go serve their country during a time of two wars, and not go to college or not go into corporate America. I feel like when you look at the success that military veterans have had over the last four years in corporate America, it’s huge. Now you have companies—they don’t have military veterans included in their diversity recruiting programs because they think it’s the right thing to do, although it is, but they are including them and they’re recruiting them because they realize that is a significant talent pool for them to recruit into their company. In many cases, they’re fighting over them and they’re competing for them, which is a big step. It’s not across the board, but we’ve encountered so many more companies that have realized that in the last four years. Organizations like ours, while we’re only helping under 20,000 people a year, we’ve been one of the biggest voices in this space. We’ve been one of the biggest advocates of military veterans taking ownership of their own transition. Don’t wait for the government or anybody else to do this for you. Work with us and together we’ll put together your plan, a phenomenal resume, practice your ability to speak, present your skill set in a verbal interview, deliver your value proposition to a company, and look to find the right employment opportunity. 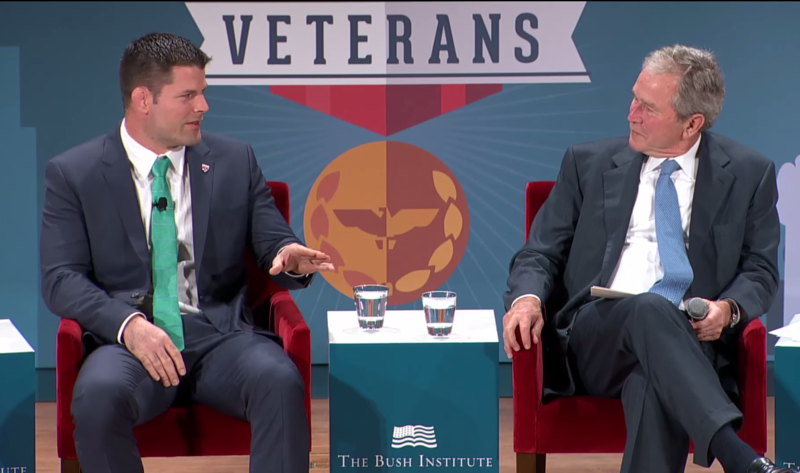 Stann speaks with President George W. Bush about the challenges facing returning veterans. One of the issues that doesn’t get talked about a lot with veterans is our rate of turnover. Over 40% of veterans who leave their first job within the first year coming out of the military, do so because they take the first thing that comes to them and it’s not what they want to do. It’s not a cultural fit. As you know, you bounce around to too many companies in a short period of time, nobody wants to touch you. We’re always a little cautionary about the word passion, right? So many people say, “I want to do something I’m passionate about.” How many people do you actually know are 100% passionate about what they do for a living every day? We want to try to avoid that. We want them to invest their time wisely. By finding the right opportunities, it only helps grow the brand of military veterans. Companies then realize that they’re great investments, that they’re a great source of talent. That the American people don’t look at us all like we’re Marcus Luttrell or Chris Kyle; the only movies Hollywood puts out make us all look like we’re damaged, make us all look like we’ve all been in major battle when it’s only a small portion of the military who’s seen high intensity combat, and a small portion of the military that returns home that has post-traumatic stress disorder. The same percentage of our regular population has the same issues, has post-traumatic stress, as well. Lots of people have that. It’s not just a veteran issue. RI: That’s a great point, yet it does affect a lot of returning veterans. If a guy might be suffering or is suffering and he’s also trying to find employment, where are your responsibilities to that guy? Is it more about helping him find treatment first or are you also trying to get him employed at the same time? BS: One of the most important things about running a nonprofit is to stick to what you’re an expert at. A lot of nonprofits make the mistake of expanding their programs to chase funding, into areas where they don’t have expertise. We’re not experts in diagnosing or counseling. I will tell you this: we have good partners that we will recommend to someone if they bring that up. At the end of the day, there’s a million different degrees of post-traumatic stress. I have probably hired, I don’t know how many different military veterans who have probably been diagnosed with post-traumatic stress, and never had one issue. People have post-traumatic stress from being in a car accident. People have post-traumatic stress from losing a loved one. They still go to work every day. Just because you get sad about something when you get reminded of it just makes you human. It doesn’t make you hard to work around. Hollywood has exacerbated the problem and made it look like we can’t walk to the grocery store without having flashbacks and cold sweats. It’s nonsense. I would tell you that most of the effects of having post-traumatic stress begin to go away when a veteran is meaningfully employed and they have responsibility again. When you’re busy, your mind doesn’t wander to dark places. I’ve said that for years. When you are entrenched in a project, you’re on a team, you’re able to put food on the table for your family and you can live your life, guess what? You’re not sitting there focused all the time on the buddies that you lost or that horrific thing that happened when you were on patrol one day. You’re able to put that in perspective and understand that, “Look, that was a part of my life that I served my country and it’s awful, but that is a part of combat. It’s terrible and it doesn’t do me any good to use that as a reason to become a victim or to start doing negative things, to abuse substances, to get angry.” That doesn’t help anybody. RI: That’s a great answer that offers some wonderful perspective on something that is very misunderstood. Since you mention it, you are one of the guys that saw some pretty extreme combat while you were over there. Did you have to deal with PTSD? BS: Of course combat like that is going to change a person. For me, I’ve been very fortunate where I’ve always been employed. I met John Bardis seven months before I transitioned out of the military. I was competing as a professional mixed martial artist for the last two-and-a-half years of my Marine Corps career. I was actually using MMA and doing a program for veterans that were struggling with the post-traumatic stress after their deployments. The thought process there was, “Look, nobody’s going to feel soft talking about their feelings or their experience if they just trained submission holds, grappling, and punching. You’re going to feel pretty darn tough doing that.” Then all of a sudden everybody in the group is just talking about, “Yeah, sometimes I get angry about this,” or, “Sometimes I get sad about that.” After they left that workout, they never went home angry. RI: So you stayed extremely busy. BS: There has to be something that balances us. Some people run. Some people paint. Some people knit. Some people read. For me, it was martial arts. Every time I got back from combat, I immediately got back in the gym and started training. There’s something about that sport, that training, that put things in perspective for me and made me realize very early on that no matter how sad I am about losing one of my Marines or what happened on a certain day or losing one of my closest friends, I don’t memorialize them. I don’t do anything constructive or positive by using them as an excuse to fail, to be depressed, to be miserable, to take backward steps in my life. I owe it to them to move forward. I owe it to them to help other people move forward. That’s what truly memorializes them. That’s what they would want. They’d give anything to live one more day. How dare I waste a day in their memory. 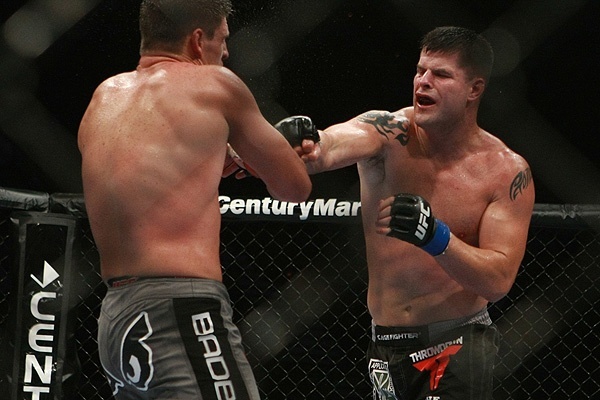 RI: If the VA ever wanted a new leader and said, “ Here’s this guy Brian Stann who’s a higher profile guy. He’s done this amazing thing with Hire Heroes. Maybe we could use his leadership.” Is that something that you would ever be interested in if they came knocking? BS: Certainly. I would tell you that I am nowhere near qualified to run an organization of that size right now. I think that the new gentleman that they put in place is phenomenal. I had the chance to meet him. For me, I think my expertise is specifically in employment. That’s only a portion of what the VA does. We’d be happy, if they came to us tomorrow, knocked on our door, said, “Hey, look, what are you guys doing that’s so effective?” We would hand them the playbook. There’s no patent here. We’re working as if we had to put ourselves out of business, to get to where there are no unemployed veterans. We’d do that in a heartbeat. Unfortunately, though, there’s 450,000 of them right now. RI: You just received a $1 million grant from the Walmart Foundation. Is it earmarked for anything in particular? BS: Every area of this organization helps veterans and spouses get jobs. That’s it. That’s what we’re great at. It would be irresponsible for us to try and expand to do other things that we’re not experts at. It’s going to help us help thousands more people. One of the issues that we have right now is the demand for our services is more than we have the capacity to serve. We’ve been so good at what we do. We could get up to 600 people a week asking for our services. We can typically only bring in 300 to 350 and give them that personalized coaching. We tier the system and make sure we bring in the people who really need us the most. There are a lot of veterans that are underemployed. By underemployed, I mean they’re working multiple things and they’re not paying their bills. This grant helps us to continue to serve a meaningful, large capacity, and helps us to continue our growth trajectory, where, as you can see, over the last eight years, we’ve gone from original team of four people to just under 100. RI: You achieved a very high level of fitness during your MMA career. You’ve been on the cover of some fitness magazines. 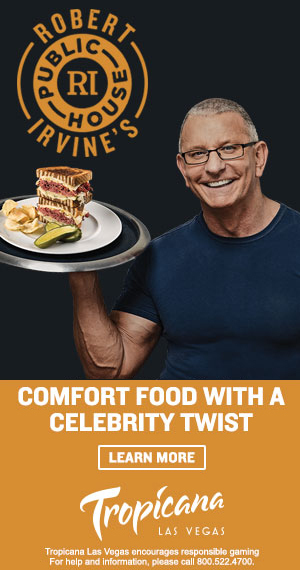 Is it harder for you to stay in shape with all your current duties now that you’re a businessman and you’re traveling everywhere? You’ve got your commentary duties with FOX. 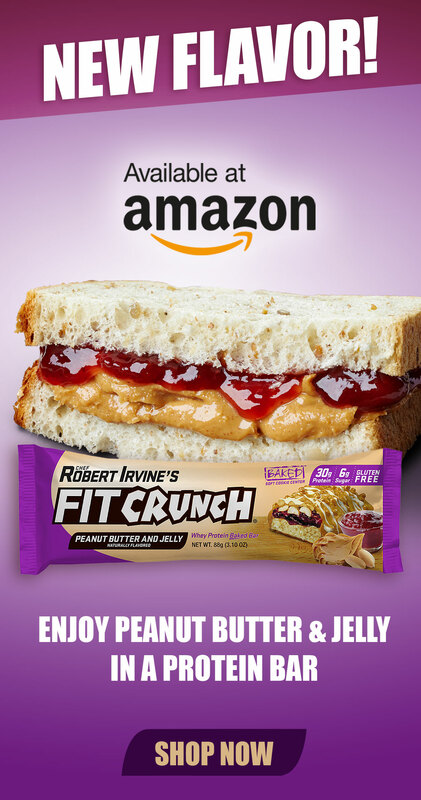 What is fitness like for you now? Is it much harder? BS: I work out every day. It’s a way of life. I’m more productive because I stay in shape. Just yesterday I was in Colorado Springs. I had a speech at 11 am, then I had to meet with my Colorado Springs office in the afternoon, then I had to drive to Denver to fly home. The night before, I budgeted my time. I asked myself what time do I need to wake up to make sure that I could hit the gym, then conduct my rehearsals, set up my presentation for my speech, do my speech, get to the office, and still make my flight? Had I not done that, there’s no way my speech would have had as much energy. I mean, today it’s going to be scheduled during my lunch break. I’m going to go to the gym and I’m going to work out. When I come back to the office after working out, I mean, I am energized and focused. Most people after they go to lunch, you have that lull from 1:00 to 3:00 where you just eat and you get kind of tired. The former Marine is also a former MMA champ, and was a Top 10 ranked fighter in the UFC. RI: Can you give us your Mayweather versus McGregor prediction? RI: It’s amazing how that happens, isn’t it? BS: Floyd will most likely beat Conor in a very, very dominant decision. I would love for Conor, who surprised me on more than one occasion, to land a big punch and lay that guy out in front of the biggest crowd we’ve ever seen. RI: I think the whole world is rooting for the same exact thing. BS: I sure hope so. I sure hope people realize how horrible a human being he is. RI: Do you ever get the itch to fight again? If not for yourself but for the way it does raise the profile of your organization considerably? BS: Every single day. It’s just like being in the military. Veterans think about going back in all the time. There’s nothing like waking up in the morning and having that fight to train for. It’s miserable, but at the same time it gets addicting. There’s no feeling like standing in the octagon and getting your hand raised because it’s just you. The amount of work and sacrifice that goes into winning a competition at that level, that feeling is unlike any other. It takes time. You never fully get away from it. But my time is best served outside of the octagon. Because I get the opportunity to call fights on national TV very often, it’s really been a great platform to continue getting attention for this mission. To watch a documentary that details the mission that earned Brian Stann the Silver Star, go to YouTube. You can follow Stann on Twitter by clicking HERE.